There are three ways to get to Big Bear. We're just 1.5 hours from Los Angeles to the base of the mountain and 45-60 minutes to get to the top of our alpine environment. Take Interstate 10 East, to the 210 East, to Hwy. 330 / Mtn. Resorts exit. Hwy. 330 goes up the hill through Running Springs and turns into Hwy. 18. Follow Hwy. 18 East and turn right across the Big Bear Lake dam. Stay on Big Bear Blvd. through the Big Bear Village. You'll find most of the reservation companies to retrieve your keys along this road. 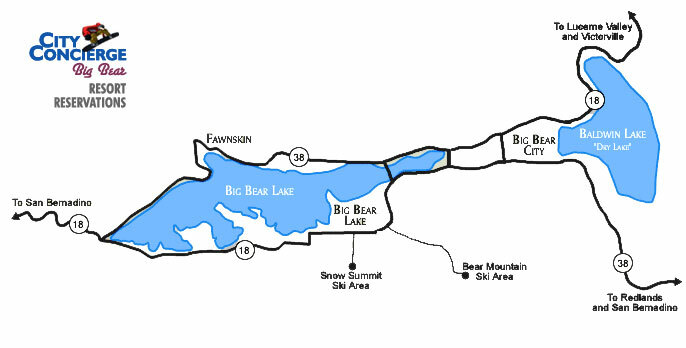 For Snow Summit: stay on Big Bear Blvd. to Summit Blvd. and turn right. Follow this road up to the Snow Summit Resort. For Bear Mountain: stay on Big Bear Blvd to Moonridge Rd. and turn right. Follow this road to the end to get to the resort. The signs will point you in the correct direction. You will have passed the golf course along the way. Take the 91 East (or the 55 North to the 91 East), to the 215 North, to Interstate 10 East, to the 210 West, to Hwy. 330 / Mtn. Resorts. Follow the above directions up to Big Bear. Take Interstate 15 North, to the 215 north, stay on the 215 north throughout the 60 / 215 merger, to Interstate 10 East, to the 210 West, to Hwy. 330 East to Mtn. Resorts, which will take you up into the mountains. While there are some sections with curves and turns they are generally only for a few miles followed by straight sections with beautiful scenery. In stormy weather chains will be required on this road first as it tops out at 8,400 feet. Always carry chains or use 4 WD in winter conditions. Take Interstate 10 East, to the Orange Street exit (Hwy 38). There will be a stop sign at the bottom of the off ramp, continue straight 1 block to Orange Street, turn left. After approximately 1 mile turn right on East Lugonia Ave (Hwy 38). Follow Hwy 38 through Mentone to Big Bear City. Hwy 38 will turn left onto Big Bear Blvd. At the first stoplight (Greenway Drive), Hwy 38 turns right. Stay straight on Big Bear Blvd which turns into Hwy 18. For Bear Mountain follow Big Bear Blvd through Big Bear City into Big Bear Lake past the shopping centers and turn left on Moonridge Rd. Follow this road and stay to the right as signs indicate. For Snow Summit stay on Big Bear Blvd to Summit Blvd and turn left. Take the 91 East (or the 55 North to the 91 East), to the 215 North, to Interstate 10 East, to the Orange Street exit (Hwy 38). There will be a stop sign at the bottom of the off ramp, continue straight 1 block to Orange Street, turn left. After approximately 1 mile turn right on East Lugonia Ave (Hwy 38). Follow Hwy 38 through Mentone to Big Bear City. Hwy 38 will turn left onto Big Bear Blvd. At the first stoplight (Greenway Drive), Hwy 38 turns right. Stay straight on Big Bear Blvd which is now Hwy 18. Take Interstate 15 North, to the 215 north, stay on the 215 north throughout the 60 West / 215 north merger, to Interstate 10 East, to the Orange Street exit (Hwy 38). There will be a stop sign at the bottom of the off ramp, continue straight 1 block to Orange Street, turn left. After approximately 1 mile turn right on East Lugonia Ave (Hwy 38). Follow Hwy 38 through Mentone to Big Bear City. Hwy 38 will turn left onto Big Bear Blvd. At the first stoplight (Greenway Drive), Hwy 38 turns right. Stay straight on Big Bear Blvd, which is now Hwy 18. Take Interstate 10 West to Yucaipa. Take the County Line Road off-ramp. Turn right. Follow County Line Road to Bryant St. Turn left. Follow Bryant St. to Highway 38. Turn right onto Highway 38, which turns into Highway 18, which turns into Big Bear Blvd. Take the 210 East or Interstate 10 East to Interstate 15 North. Follow the 15 North over the Cajon Pass towards Victorville and take the Bear Valley Road exit. Turn right (East) at Hwy 18 through the Lucerne Valley. In Lucerne Valley Hwy 18 bears to the right taking you toward the Big Bear Valley. Follow this road along the North Shore of Big Bear Lake to the Standfield Cut off, turn left and proceed over the bridge. At the stoplight turn right and follow Big Bear Blvd past the shopping centers. For Bear Mountain turn left at Moonridge Rd and stay to the right as signs indicate. 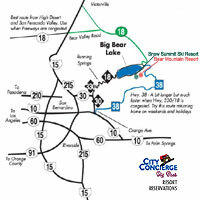 For Snow Summit follow Big Bear Blvd to Summit Blvd and turn left. Take the 91 East (or the 55 North to the 91 East) to the 215 North. The 215 North merges into the 15 North. Follow the 15 North over the Cajon Pass towards Victorville and take the Bear Valley Road exit. Turn right (East) at Hwy 18 towards Lucerne Valley. From Bear Valley Road take Hwy 18 East to Lucerne Valley. Hwy 18 bears right (south) in Lucerne Valley and heads toward the mountains. Follow Hwy 18 into the mountains and turn left (south) on Greenway Dr. Continue to Big Bear Blvd. and turn right on Big Bear Blvd. Take Interstate 10 West, Exit 117 to merge onto CA-62 East/Twentynine Palms Hwy toward 29 Palms/Yucca Valley LEFT turn at CA-247 North/Old Woman Springs Road. Turn Left onto Hwy 18, which leads up the mountain to the Big Bear Valley. Follow Hwy 18 into the mountains and turn left (south) on Greenway Dr. Continue to Big Bear Blvd. and turn right on Big Bear Blvd. Take the Interstate 15 South, to Hwy 247 South. This will bring you to the Lucerne Valley. Drive past two stop signs and turn left onto Hwy 18, which leads up the mountain to the Big Bear Valley. Follow Hwy 18 into the mountains and turn left (south) on Greenway Dr. Continue to Big Bear Blvd. and turn right on Big Bear Blvd.Take Interstate 15 North, to the 215 north, stay on the 215 north throughout the 60 West / 215 north merger, which merges into the 15 North. Follow the 15 North over the Cajon Pass towards Victorville and take the Bear Valley Road exit. Turn right (East) at Hwy 18 towards Lucerne Valley. In Lucerne Valley Hwy 18 bears to the right taking you into the Big Bear Valley. Follow this road along the North Shore of Big Bear Lake to the Standfield Cut off, turn left and proceed over the bridge. At the stoplight turn right and follow Big Bear Blvd past the shopping centers. Two major roads circle the lake: Highway 38 becomes North Shore on the north edge of the lake, passing through Fawnskin and takes you past the Discovery Center and Observatory. The south shore Main Street is called Big Bear Boulevard. It heads through the Big Bear village, past both Snow Summit and Bear Mountain resorts, past the golf course at Moonridge and toward the airport. You can then either drive around the lake to the north, or head out of town toward Sugarloaf, and many of the horse stables on the east side of the mountain. Great views on the east side, looking toward Palm Springs desert!